The book is 8-1/2” x 11”, has 122 pages and 382 figures. 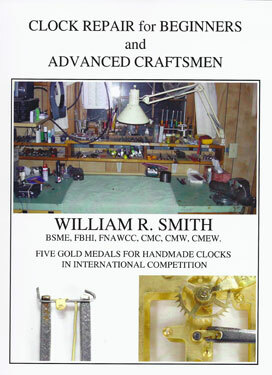 Except for the basic techniques offered to help the beginner get started, I have tried to avoid repeating most material found in current clock repair books. Thus, the reader will find unusual information, such as how to install clock bushing using the simple Preacher to maintain proper depthing, how to make a Jacot tool for pivot polishing on the Sherline lathe and the Myford lathe, a simple tool for doing lantern pinion work, tools for adjusting bent pallet escapements, a set of homemade pivot supports for pivot polishing are also offered. A simple homemade gage for measuring the correct length of in-barrel mainsprings is presented, as are a number of useful tricks, such as spinning true, screw length management tools, silver solder draggers, how to make index plates from scratch, adapting the Sherline lathe for wheel cutting and pinion making, the use of super glue arbors, a center finder for re- pivoting, a Sherline saw table, sheet metal drills, CNC indexing, replacing a ratchet wheel tooth, replacing train wheel teeth, making lantern pinions, cut pinions and factory type lantern pinions. Included is information for making and using a pinion head depthing tool. Also illustrated is the use of a conventional depthing tool for correcting bad depthing in a clock train. Two methods for replacing broken barrel teeth are offered. The use of a bull’s-foot file and 35 mm film for reducing a bushing to plate thickness is illustrated. The usefulness of adjusting rods in clock repair is described, as is the technique for re-pivoting an arbor. For the benefit of the beginner, I felt compelled to include some material found in other books, such as bushing plates with a conventional bushing machine, replacing a click rivet, bent pallet adjustment, etc. It is likely that this book offers the most complete description of clock shop tooling and its uses of any book currently available. Some of the tooling is not found in any present book. Any beginner or advanced craftsman will find this book a great source of needed information.